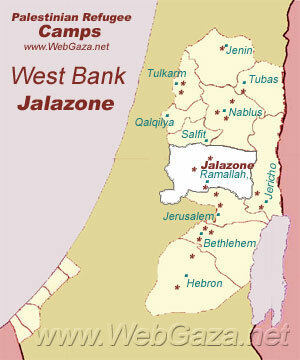 Jalazone Refugee Camp - Where is Jalazone Camp Located? Most of the original refugees came from 36 villages in the Lydd and Ramleh areas. Like other West Bank camps, it was established on land UNRWA leased from the government of Jordan. The camp came under joint Israeli-Palestinian control following the Oslo agreements. Where is Jalazone Camp Located? Jalazone camp was established in 1949 on 0.25 square kilometres of rocky hillside, it is located 7km north of Ramallah. All shelters are connected to public water and electricity, but many are not connected to the sewerage system, instead using private latrines connected to percolation pits or allowing waste water to flood into the roads. Small businesses in the camp have increased as it has become increasingly difficult for workers to gain access to the Israeli labour market.